Had this sitting in my basket for a few days and it has now dropped to the lowest price ever according to camelcamelcamel. Averages 4.6 out of 5 stars from 372 reviews, and comes with a 5 year warranty. 5 years is more than enough, as by that time the Singularity will have arrived and we'll be transhuman machines powering ourselves through solar panels embedded in our skin. The EVGA GQ series thus far looks to be really strong, so far some of the best performing stuff that's come out of the FSP factory. I like these units, even though I still can't see why EVGA needs to have so many units from so many different manufacturers all competing with one another. True, these don't quite match the performance of the G2 and GS lines, but they really do come close enough for most people. can't think of nothing... wait, that doesn't work. Can't think of not nothing. There we go. Good price, hot from me. Good price I got it for £73 in October, I heard what I think was coil whine a few weeks ago but nothing before or since then (could have been one of my other components but it fixed itself anyway). Excellent value for money. I'm currently running an 850w EVGA G3 Supernova in my machine and its been excellent for the money paid. Was looking to upgrade my old bronze 650W I bought a while ago, shame this went back up to 80 quid. Still waiting on the 8700k to come back in stock on Amazon so not in a rush. Excellent value for money. 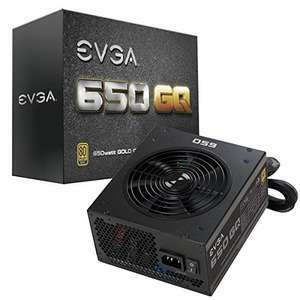 I'm currently running an 850w EVGA G3 Supernova …Excellent value for money. I'm currently running an 850w EVGA G3 Supernova in my machine and its been excellent for the money paid. But aside from the EVGA badge (and if something goes wrong their customer service which is meant to be quite good), this GQ supply has nothing to do with your G3 Supernova. Yours is made by the top-notch SuperFlower. This is made by FSP. Who can be okay, but I would never compare them to SuperFlower or Seasonic. Was this price at eBuyer when I ordered two on Saturday. Not available any more so perhaps a brief price match? Best advice I've seen on here in ages.